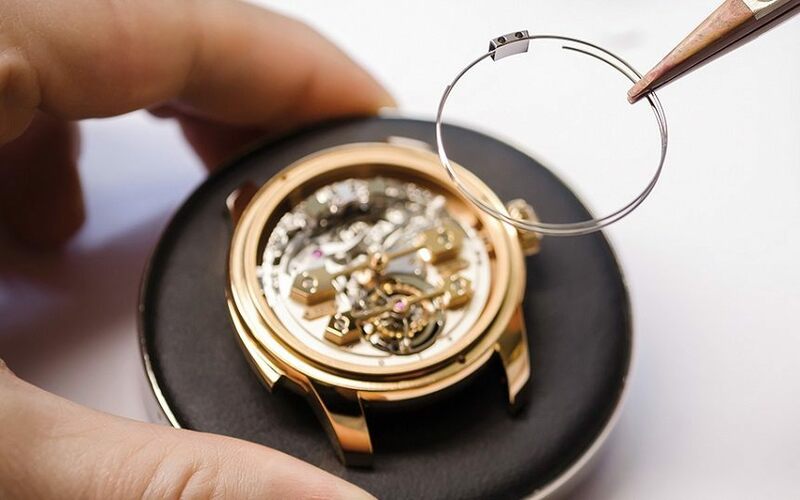 While many believe the death knell for mechanical watchmaking is fast approaching, the chime of the Girard-Perregaux Minute Repeater Tourbillon With Gold Bridges rings out in opposition. The sound is one of defiance and optimism, and the watch, a standard bearer for an army that will never surrender. In an era of gadgets, gizmos, and ever-smarter wrist computers, this new offering from Girard-Perregaux reminds those who preach doom and gloom that haute horlogerie shall not only survive, but prosper in a highly competitive world. I’m too young to have lived through the quartz revolution. I was born in the middle of the eighties, two years after the foundation of Swatch. Back then, it was too early and too precarious to predict the startling renaissance of mechanical watchmaking, but it happened because the world wanted it to. As watch aficionados, we now live in blessed times. The output of major maisons is evermore complex, and the diversity of low-priced indie companies never more bountiful. And although the electronic invaders might well corner a certain segment of the market, they can’t steal the heart of watchmaking. 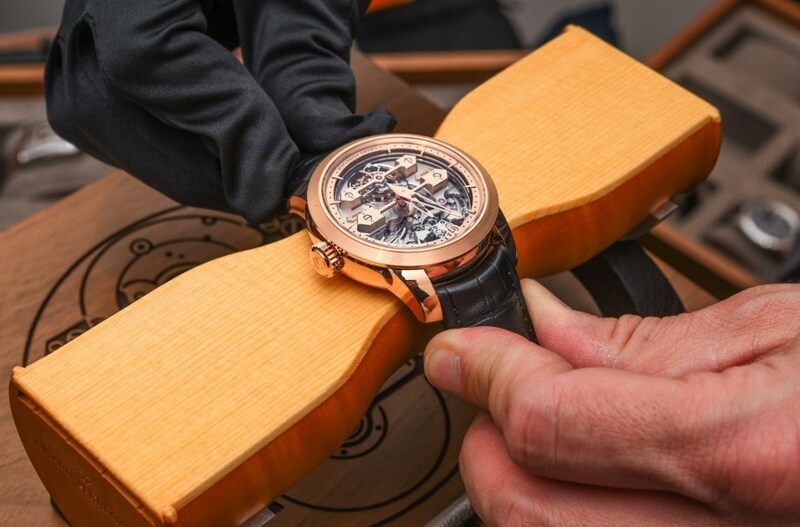 And if you’re lucky enough to own a Girard-Perregaux Minute Repeater Tourbillon With Gold Bridges, you’ll be reminded what that sounds like every time the chime goes off. What’s really cool about this piece is the way it balances technological innovation with traditional aesthetics and the expertise of centuries. Drawing inspiration from a history that stretches all the way back to 1791, Girard-Perregaux have given the mechanical structure of the striking mechanism totally new dimensions. They’ve done this for good reason. Because of the new hammer/gong layout, the striking mechanism now fits neatly on the dial-side of the watch so it can be enjoyed visually, as well as increasing its acoustic efficiency. Simply put, the sound has less material to travel through to make it to your ears, which should result in a louder, clearer chime. 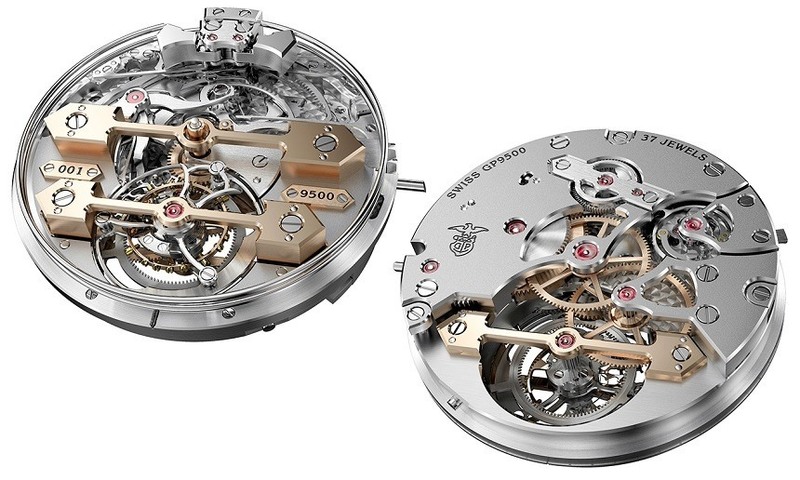 Now, this isn’t the only time a brand has redesigned a movement to put a striking mechanism on the dial-side (A. Lange & Söhne have displayed the hammers in the Zeitwerk model, and check out this Ulysse Nardin for an example of a music box watch that positions the sounding mechanism in a similar way to amplify its output), but it is new in the sense that all the parts and their layout have been created especially for this piece. 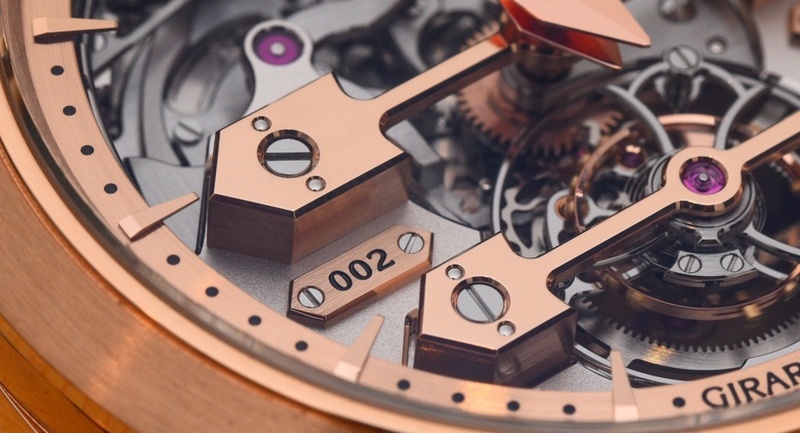 And it must be said, they have been created superbly, with a level of exposure I am not sure I have ever seen on the dial-side of a minute repeater. If someone asked me to explain what I love about watchmaking with a single part, I reckon I could win them over by handing them one of those beautifully bevelled hammers that you can see sitting in tandem at 12 o’clock. I mean, it’s totally irrational to actually feel something when you look at a tiny piece of hand-shaped metal, especially when removed from its functional context, but hey, I just don’t care, because it feels really, really good. If you take watch design seriously, you start to see watches as objet d’art. You start to appreciate how all those minute pieces can come together to create something that appears to have been grown rather than built. The ultimate goal is to make each individual part appear as such. 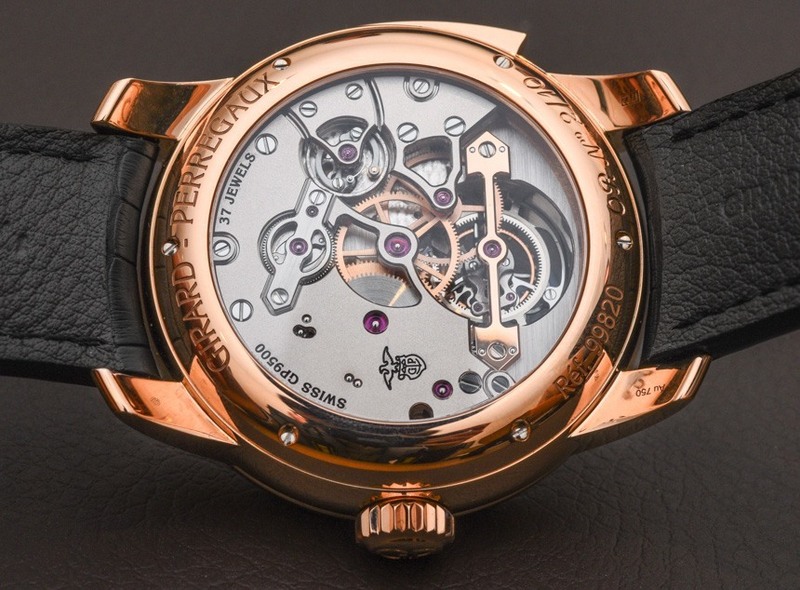 Girard-Perregaux have had success with a lot of the external components in this watch, but it’s the movement that steals the show. 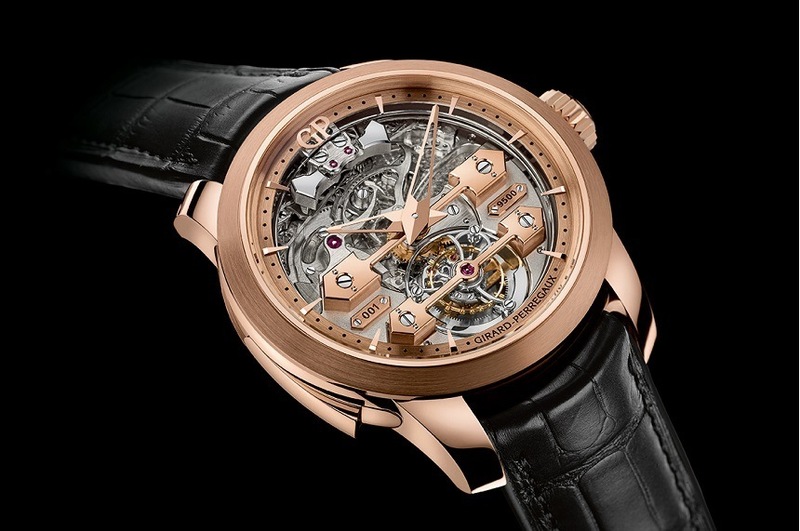 The Girard-Perregaux Minute Repeater Tourbillon With Gold Bridges features a bi-colour movement with a frosted base plate that sports the GP logo (which was patented in 1884, making it the same age as Breitling) on the movement-side. The 37-jewel GP9500 offers a power reserve of 58 hours minimum, is 9.35mm thick, 32mm wide, and operates at 21,600vph. The crazy thing about the calibre GP9500 is that you almost forget to mention the tourbillon, so arresting is the minute repeater. But one should never overlook something so well executed. 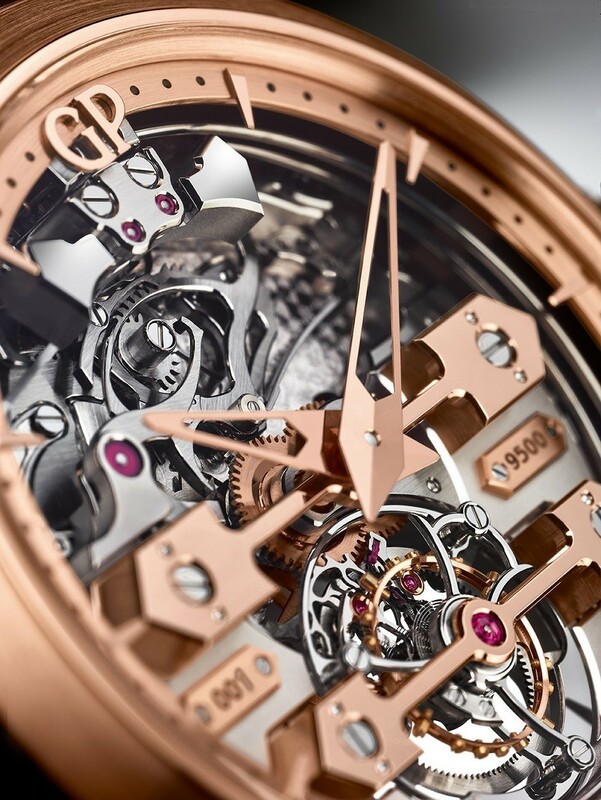 The 13.6mm-wide tourbillon carriage is stunningly wrought from 91 components that weigh in at a breathtaking 0.49g. 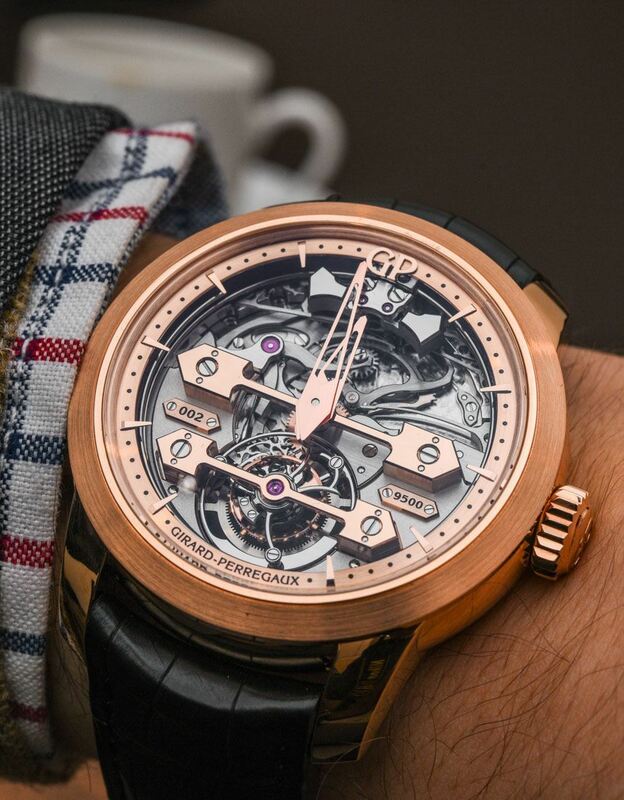 It may not be the main attraction of this watch, but when a complication of such excellence is playing second fiddle to another, its worth listening to the tune of the headline act. 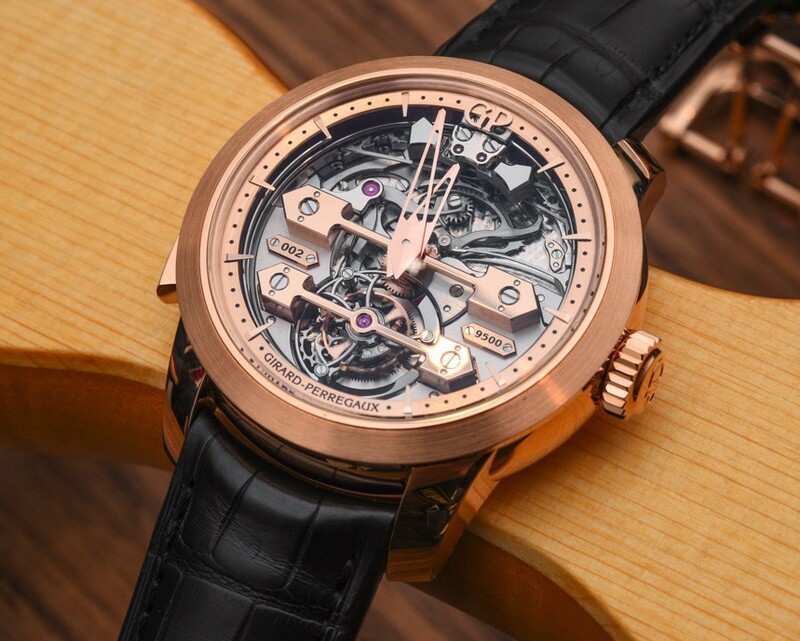 And it’s the tune, and nothing but the tune, that Girard-Perregaux want to reach your ears! 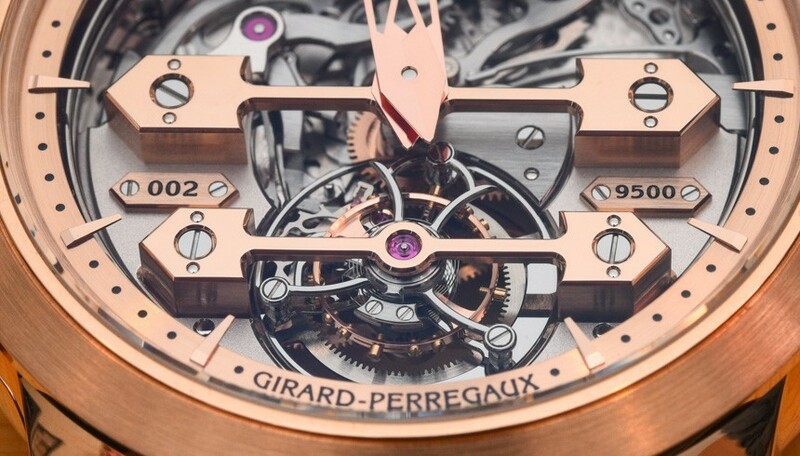 Girard-Perregaux have elected to keep the flywheel hidden to eliminate acoustic interference. 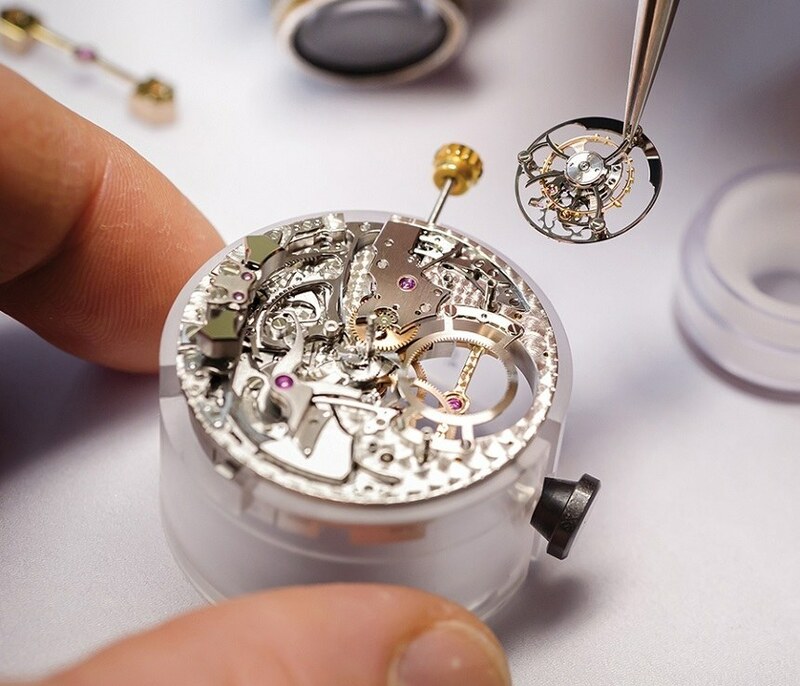 However faint the whizzing of the flywheel (located on the movement-side, and which is used to regulate the hammers’ striking speed) may be, Girard-Perregaux wanted the sound from the gong to be as clear as possible. The protrusion on the left-hand side of the case is a ‘sliding trigger’ used to wind the striking mechanism. The minute repeater has its own barrel and the spring is wound when the sliding trigger is operated. This action can be seen on the dial, enabling the wearer to feel connected to the operation and maintenance of their watch. It’s little touches like this – touches that encourage us to engage with our timepieces, to take the time to interact with them – that transform a watch from a tool into a friend. You have to wind the minute repeater barrel until it is fully charged, or the on/off switch won’t be released. This is to prevent an erroneous acoustic emission. When fully primed, the mechanism strikes on the hours, emitting a low tone, then the quarter hours in a combination of high and low tones, and also the minutes in a high tone. The 18 karat gold hammers, styled in homage to the early Girard-Perregaux bridges, are mounted on jeweled bearings to ensure a smooth transit. 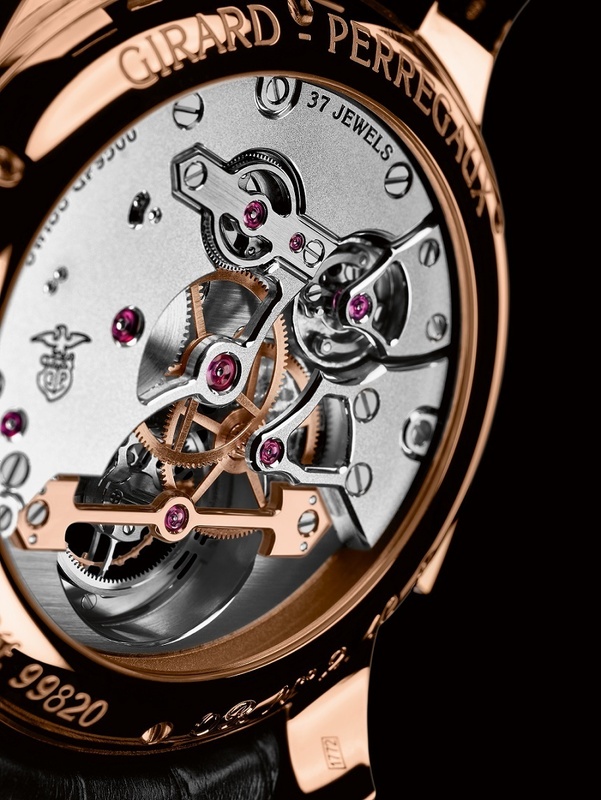 Everything about the case, its volumetric relationship with the calibre, the doming of the sapphire glass, and the materials used in the entire construction have been considered to minimize interference and deliver a crisp, well-amplified tune when the gongs strike. And when it comes to branding, the Girard-Perregaux Minute Repeater Tourbillon With Gold Bridges does not forget its duty. 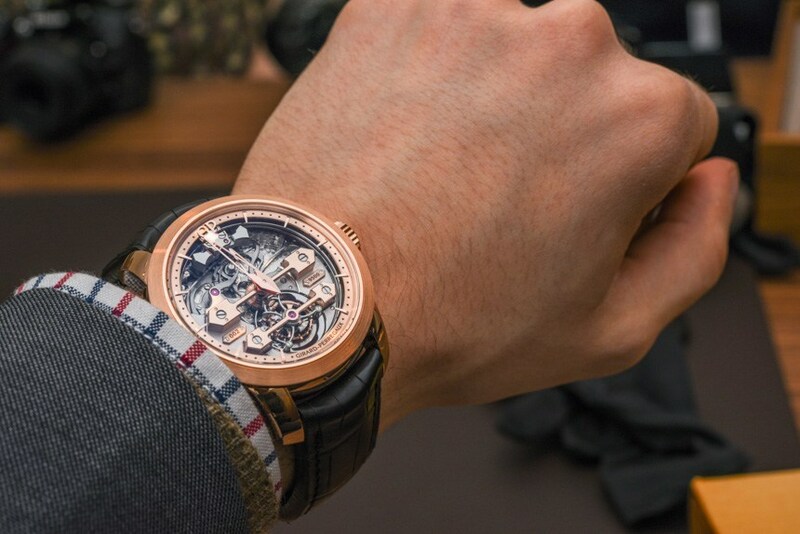 The Gold Bridges themselves are chunky, arrow-shaped girders of pink gold and unmistakably Girard-Perregaux. 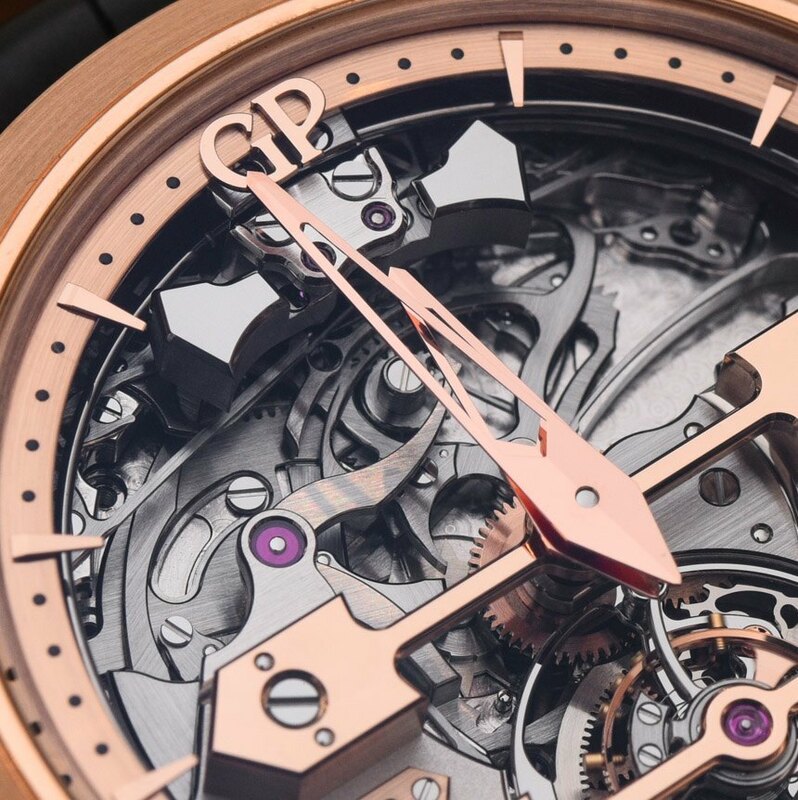 The GP initials feature at 12 o’clock, nestled between the hammers, and the watch’s serial number and calibre code are displayed on small pink gold plaques around 9 and 3 o’clock. The pink gold case is 45mm wide with a case back held in place by six screws, resulting in water resistance to 30 meters. 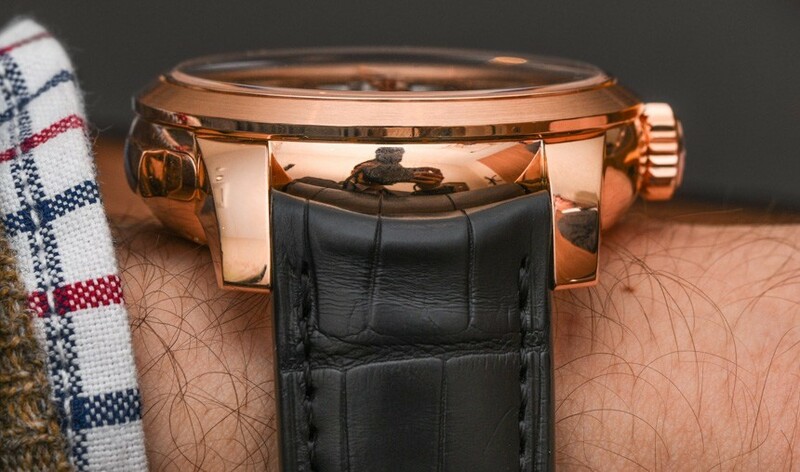 The watch has a black alligator strap with a fold-over pink gold buckle. 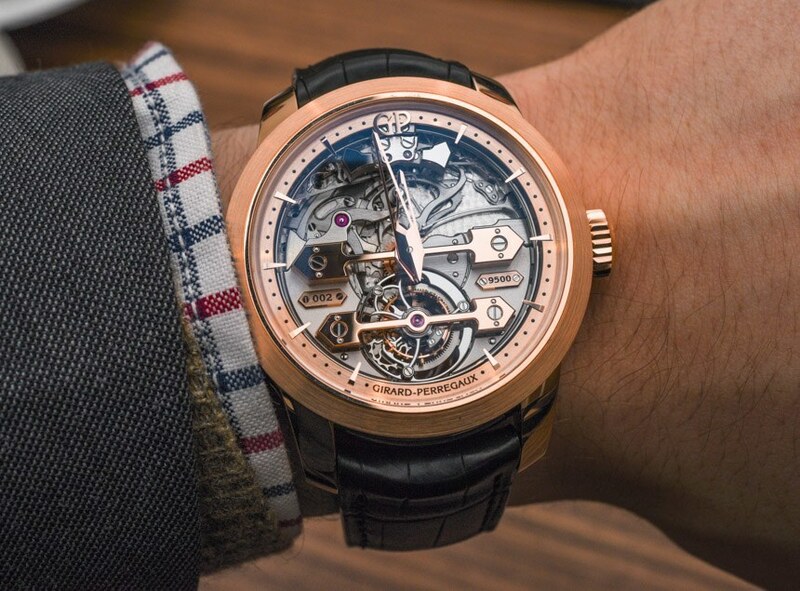 This is clearly a Girard-Perregaux, but also very clearly something unusual.